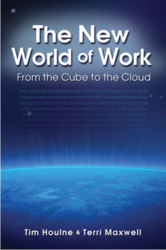 The new, eye-opening book, The New World of Work: From the Cube to the Cloud, credits virtual business models for multiplying job opportunities and spawning new career paths. Companies adopting the new world of work mindset gain significant competitive advantage and cost savings. Co-authors, Terri Maxwell, CEO of Succeed on Purpose, and Tim Houlne, CEO of Working Solutions, cite the latest statistics from a plethora of relevant sources. The authors reference Telework Research Networks, which states businesses that let one hundred employees work half of their time from home can save more than one million dollars a year. In addition, companies can find better talent virtually, without borders, simultaneously increasing profitability, productivity and worker satisfaction. The New World of Work: From the Cube to the Cloud identifies key virtual work platforms that have revolutionized the talent marketplace. Companies such as oDesk, Elance.com, Freelancer.com and Working Solutions link corporations with virtual talent to fill work gaps on a contract basis. They are essentially matchmaking projects to talent. As an added benefit, the virtualization of careers is good news for the economy because the professionals who choose this path – the Virtualpreneurs™ – will find plenty of work. Maxwell and Houlne have donated books to their alma mater, University of Texas at Dallas (UTD), to allow a fifty percent discount at the UTD Bookstore. View a video book trailer here.